I know that I don’t catch squid every time I target them, and that keeps me coming back time after time. 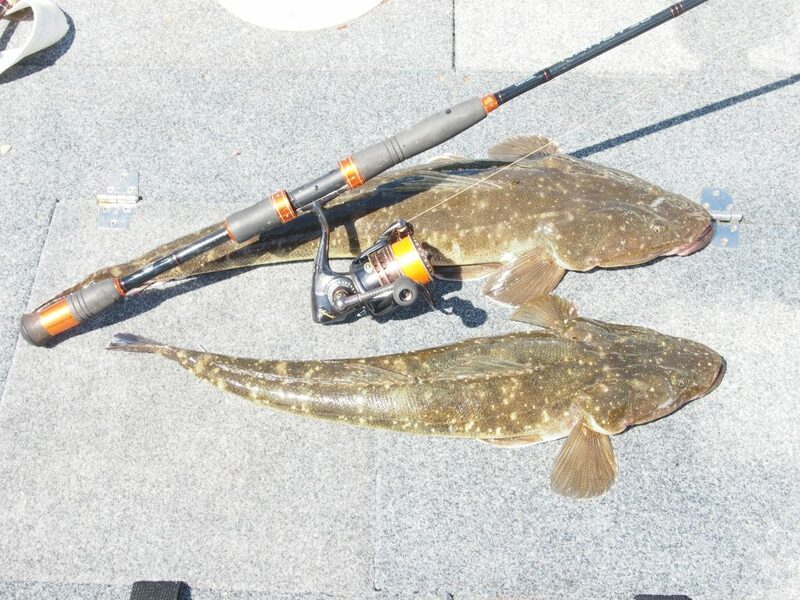 When I do catch them, my major problem is whether I use my catch for bait or to take them home for a delicious meal. Decision, decisions! What to do? For me the decision of what to do will relate to what type of fish species I intend to target on the day, or if I am just after a feed of squid. If I am just after a few squid for a feed I don’t mind what size I get, just as long as I get about half a dozen. However, it’s a different ball game if they are to be used for bait. 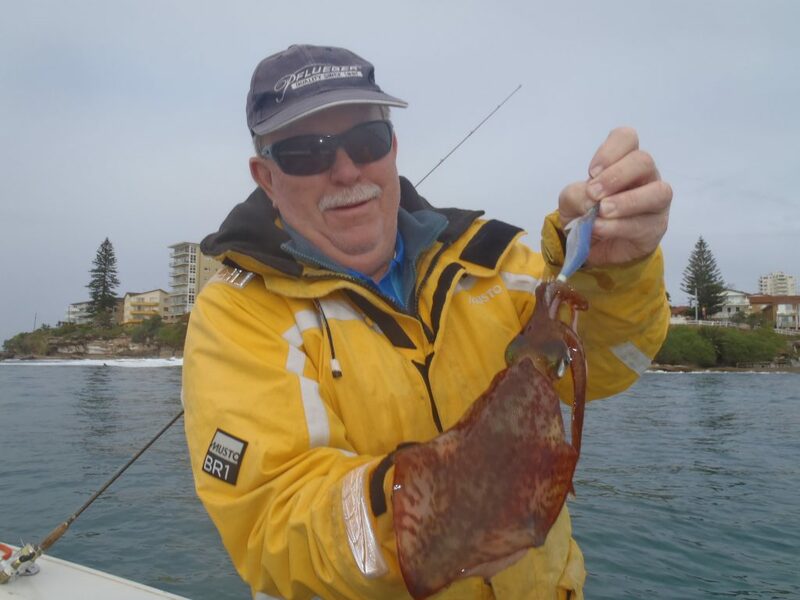 As an example, I recently went out to target kingfish with my son-in-law Andrew in Botany Bay, and we only managed to get three squid in an hour. Two were around 100mm in body length and one was 400mm. We trolled the two small ones for almost two hours and never got a strike. I even tried stripping the squid and still had no luck, so the squid/kingfish session turned into a take home and eat them session. On other days, however, the action has been fast and furious, which has made for some great kingfish catches. Adam recently came out with the author to Port Hacking to see how it was done. The author didn’t have to show Adam much, as he got the biggest for the morning session! 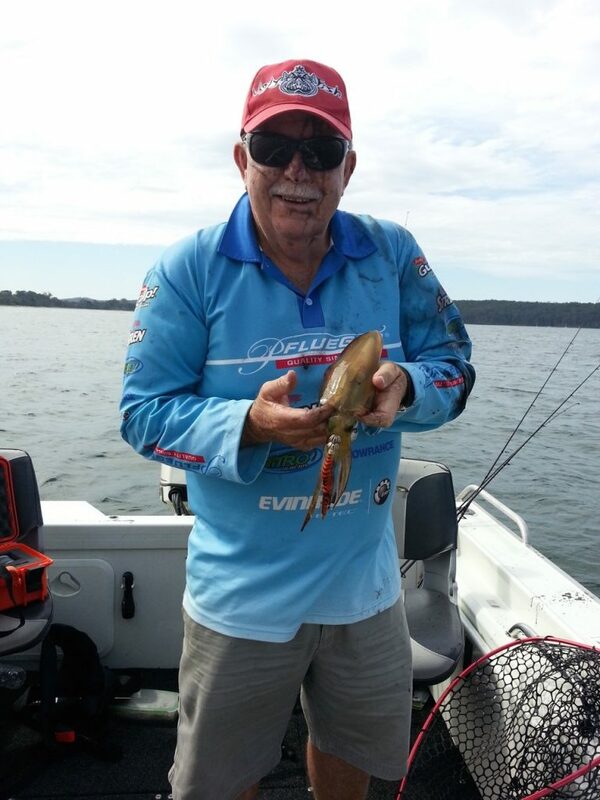 I only use squid strips that are around 10-12cm long when targeting flathead. This is what happens when you get the killing of the squid wrong. The colours indicate that the brain is still alive. 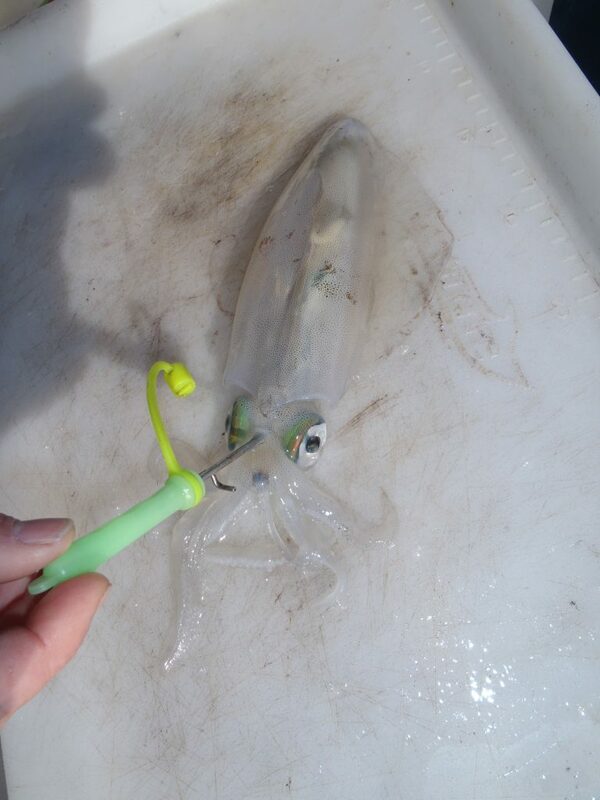 When trolling a live squid, I use a sliding, two-hook snooded rig and use a sinker as a poor man’s downrigger. The whole of the squid will go white when you have found the correct spot in the brain. You need to get yourself a squid spike if you are going to eat them or use them as dead or stripped baits. 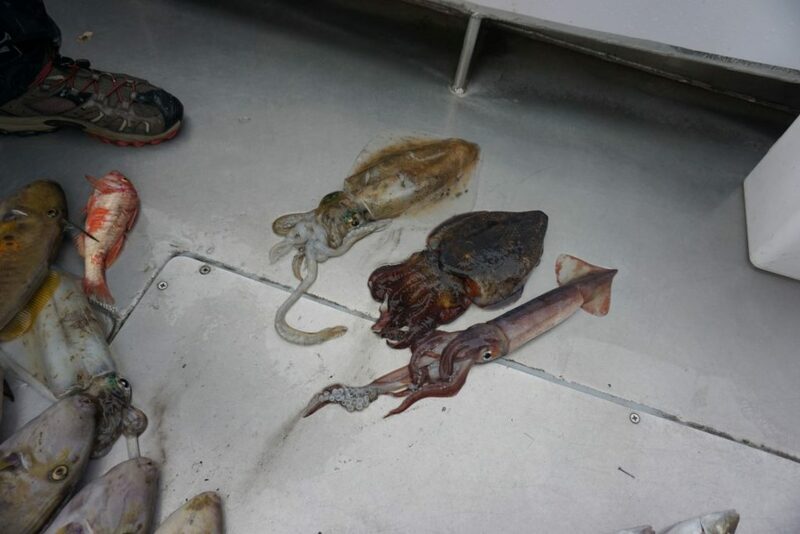 These calamari, cuttlefish and arrow squid were caught while fishing in Port Phillip Bay for King George whiting. They were cut into strips for the whiting. 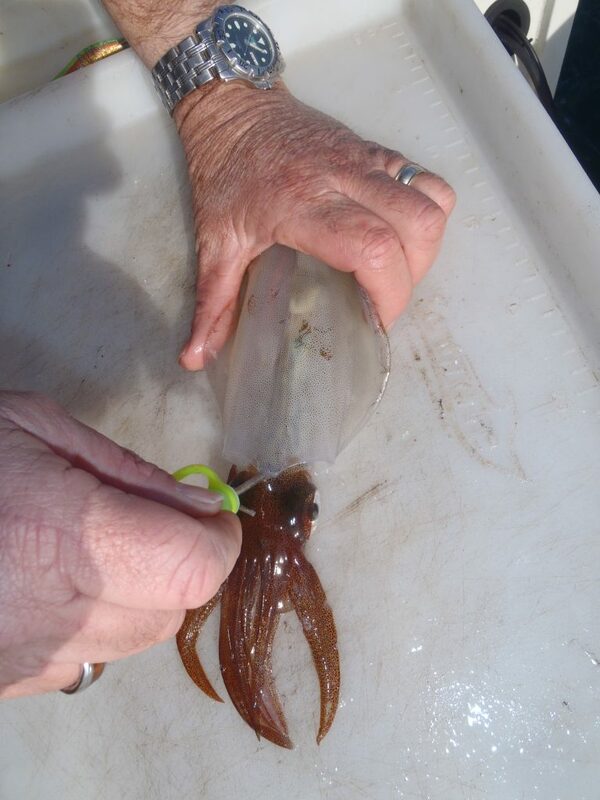 Everyone gets it wrong at some time or another when netting a squid. Even the author! Make sure that you take care of the needle sharp points of the squid. I spray INOX on them after I have washed them with fresh water. When you keep squid alive you need to have plenty of running water in your livewell or have an aerator fitted. 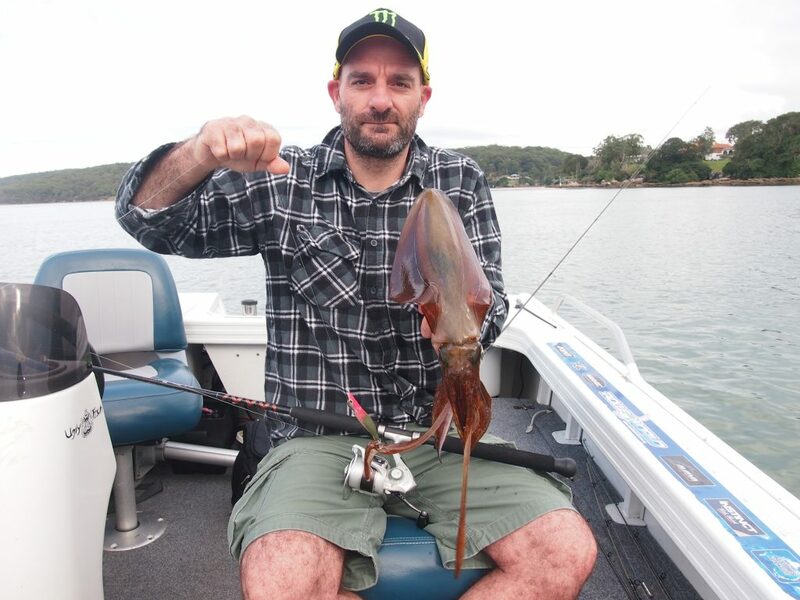 While competing in a BETS bream tournament up at Foster and fishing in the racks, the author made a quick change from a soft plastic that was meant for a bream to a pink squid jig and this squid was hooked. Note the colour of the squid jig. Pink! One of the author’s favourite colours to use. This squid is destined for the pan. 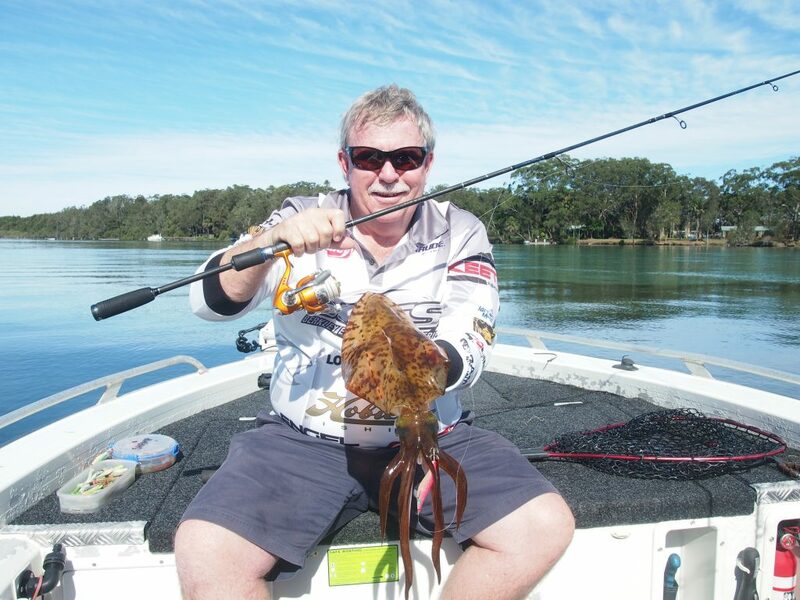 John from Fergos Tackle at Taren Point just loves his squid. So much so, that he releases all of his larger specimens. 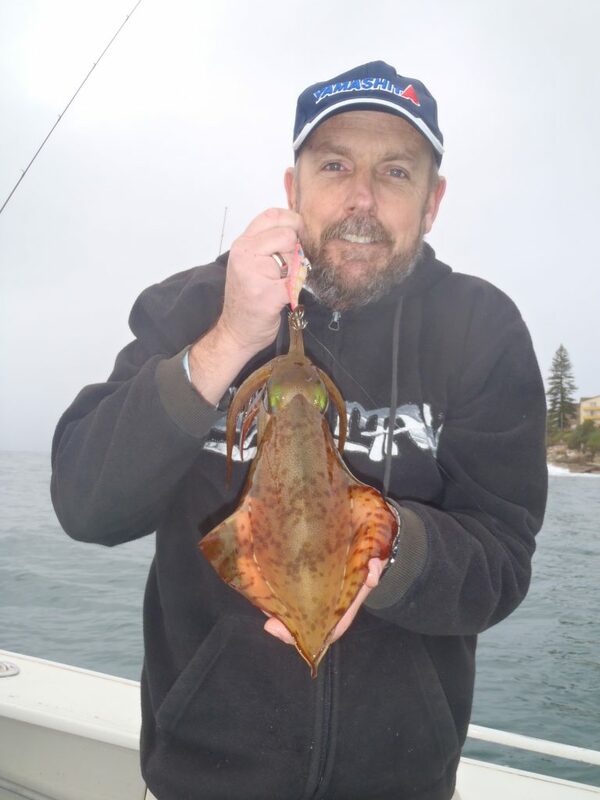 Over the years I have caught squid over kelp beds, ribbon weed beds, off the rocks, around rocky headlands, offshore reefs, in clear and dirty water, cockle beds, deep and shallow water, sandy bottoms and even where the beach meets the rocks. The trick to find where the squid hang out is to make sure you don’t spend too much time at one location. If you haven’t found them after about 20 minutes it’s time to move on to the next spot. To give you an example, if you were fishing in Botany Bay you could start off fishing the patches off Towra Point, then move out into the deeper water at the edge of the drop-off. No luck here? You could go over to the end of the second and third runways, then the north-western corner of the retaining wall at Port Botany, Trevally Alley, the NE corner in Yarra Bay and then make your way over to the inside of Bare Island and Henry Head. Try over at Sutherland Point, Watts Reef and then over the groynes off Kurnell. If you still haven’t got a squid, just try for something else or call it a day. The next question is, ‘what is the best technique to catch squid’? The answer is simple: the one that catches them on the day. The technique you use today may not work the next day. The same goes for the size, weight and colour of the squid jig. When working a rocky shoreline with kelp along it you can position the boat parallel to the shoreline, then cast along the shoreline and slowly work the jig in long, slow draws back to the boat. 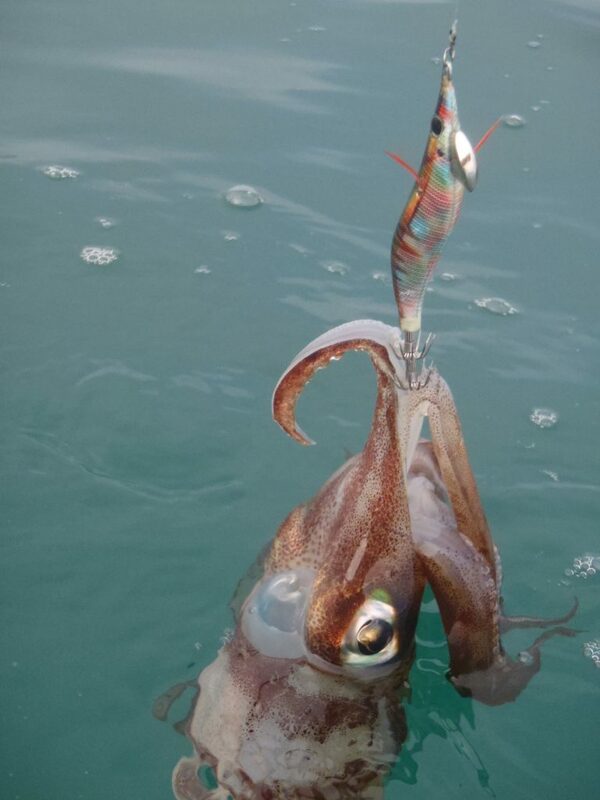 Allow the squid jig to slowly sink down and at the same time make sure that it doesn’t get hooked on the kelp. 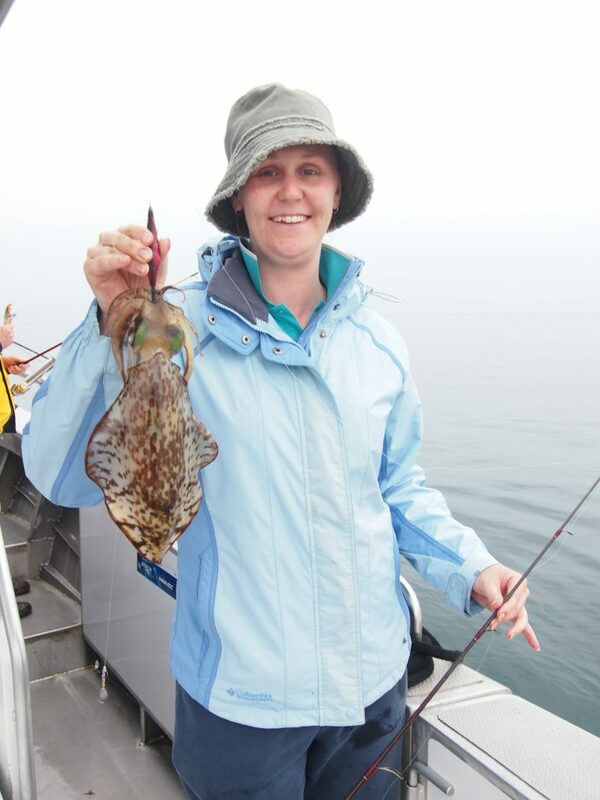 On the other hand, you could position the boat about 30m out from the rocky shoreline and cast to within a metre of the shore and slowly work the squid jig back out towards the boat. This time you will need to allow the squid jig to follow the contour of the bottom. When drifting down through a sandy channel you will need to cast out as far as you can. Allow the squid jig to sink to the bottom. Once it has hit the bottom you can either slowly wind (half walking pace) the jig back to the boat. If that doesn’t work you can once again cast out as far as you can and once it has hit the sandy bottom, rip the squid jig back like you would when soft plastic fishing for flathead. Don’t forget to let it hit the bottom before ripping the rod tip back. Both of these techniques can be used to cast towards or away from where you are drifting. Set up the rod with a paternoster rig and instead of putting on a sinker and a hook, put on two different coloured squid jigs. Make sure the bottom one is heavier than the top one. Lower it over the side and down to the bottom and wind it up a few turns. Then sit it in the rod holder and work a second rod with a squid jig on it. 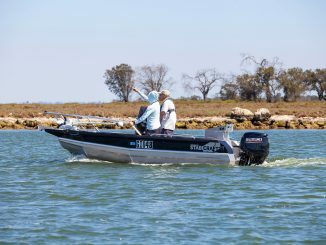 The rod that I prefer to use for this method is the Shakespeare Ugly Stik, as the motion of you moving about in the boat or the wave action will cause the squid jigs to bounce up and down. Make sure that when rigging the squid jigs that they can’t tangle with each other. 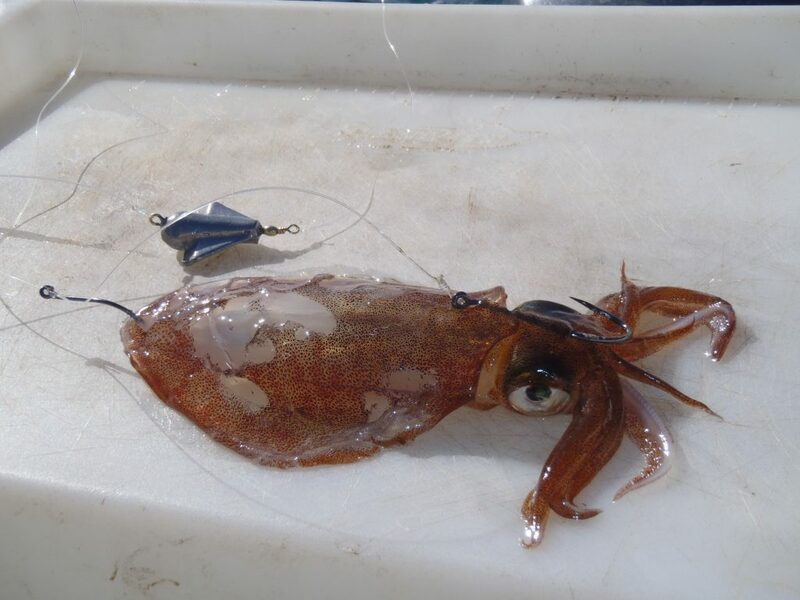 Whether you are fishing out of a boat while drifting or at anchor, fishing off the rocks, or from the shore in the estuary you should try to suspend the squid jig about 1-2m underneath a bobby cork. Once again, the motion of you moving about in the boat or the wave action will cause the squid jigs to bounce up and down. There are a number of other techniques that you could try when squidding, but these are the four main methods that work for me. As for size and colour of the squid jigs that work the best – I will leave that up to you. I mainly use 7, 10 and 15cm, in weights 2, 2.5 and 3 and always make sure I have at least one that is pink. 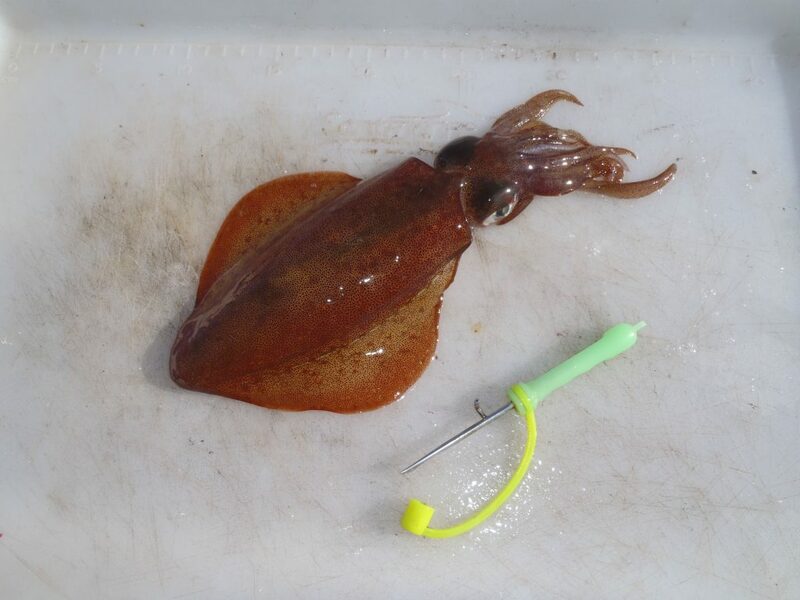 If I troll shallow or downrig with my squid I usually make sure my squid bait is no longer than 12cm in length and whole. Any larger than that I will kill the squid straight away and then cut the body into 4-6 strips and the head into two. If by chance I get any bigger ones that are around 600g-1kg I will cut off the candles, then cut the head into four pieces and cut the body in half (length-wise) and then into strips. 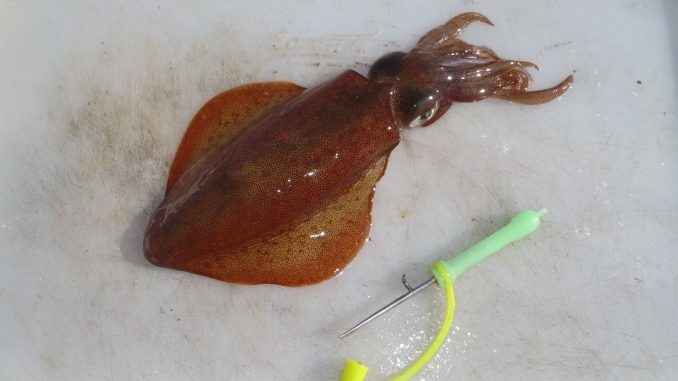 This will give you about sixteen baits out of one squid at 600g. 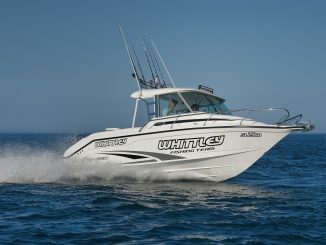 I prefer a trolling speed in deep water around 1-2 knots or in gear and then out of gear. Just so that the weighted bait is about a 1m off the bottom. When the bait is trolled near the surface, I prefer to troll between 2-5 knots. When at anchor I just lower the bait to the bottom and then wind up about 4-5 turns, put the rod in the rod holder and wait for all hell to break loose. Sometimes you don’t have time to put a second rig in the water and other times you will soak the bait for hours, wind it up and take it home and eat it. 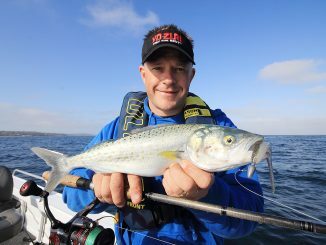 Yellowtail kingfish love to hang around fixed markers or floating navigation buoys and wharfs. If you fish from the shore you could always suspend a live squid underneath a bobby cork and with a well-directed cast you could place the live squid and the bobby cork right beside the marker. If there is a kingfish hanging around the marker, it won’t take long for it to go off. 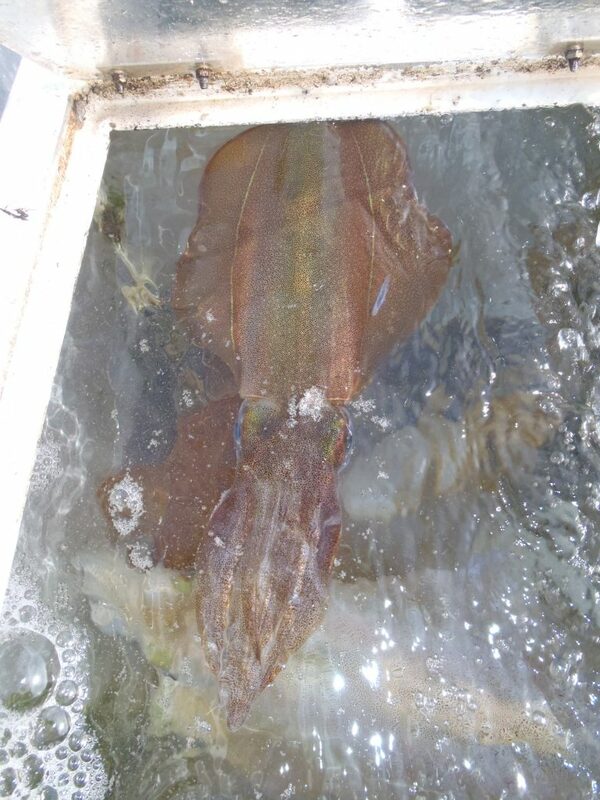 When I use squid for flathead I only use squid strips around 10-12cm long on either a single long shank or circle hook and drift, whether in the estuary or on close offshore sand and gravel spots. When I drift offshore I use a paternoster rig, and will hang onto the rod the whole time. In the estuary I only use the ball sinker down onto a swivel with a leader of no more than 50cm long and keep the rod at the ready in the rod holder. I find that I have the best success when I am using an Ugly Stik rod with its hollow blank construction and a solid tip. To top this off, I only use braid for my mainline and fluorocarbon for my leader. This gives me so much more sensitivity in touch. When I target bream while at anchor or on the drift I use two different rigs until I find which one works best on the day. When drifting or at anchor, use the sinker down onto the swivel rig. You will need to have a leader length of between 1-1.5m, and the sinker needs to be heavy enough to just keep it on the bottom. If you are using a ball sinker directly down onto the bait when drifting, the sinker needs to run freely and be heavy enough to have it slowly drag along the bottom and not get snagged. At anchor when using the ball sinker down onto the bait you will need to work out what size sinker best suits the current and whether the fish are feeding mid-water or on the bottom. 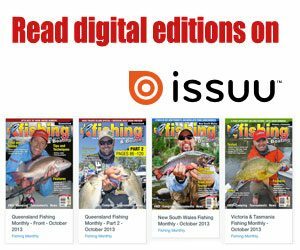 Hook size for the bream will be a number 1-1/0 Owner circle or bait keeper and for whiting a number 1-1/0 long shank hook. Whether I am fishing from the shore, out of a boat in the estuary, or deep sea for leatherjackets there is only one type of rig that I use –the paternoster rig. The only difference between fishing in the estuary and offshore is the size of the long shank hook that I use. Inshore I use a number 10-12 and offshore it will be a 1/0-3/0. The size of the squid bait in the estuary will be about a half a centimetre square just pinned and sitting in the bend of the hook. Offshore I like to have strips of between 5-10cm in length and threaded onto the shank of the hook. 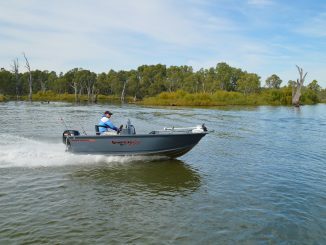 Rigs depend on what fish species you aim to target. I have to say that everything in the sea loves a feed of squid! Refer to the diagrams for species-specific rigging guides. Sure, there are specialist rods on the market, but for fishing either out of a boat or offshore I prefer to use a 2.1m Shakespeare Ugly Stik rod with either straight through 6kg Berkley Vanish fluorocarbon or 4kg Berkley Fireline with a 2-3m fluorocarbon leader. This can be used for all four of the techniques listed above. The other outfit that I use is a 2-4kg, 6’8” Pflueger Trion rod spooled with a mainline of 3-4kg Berkley Fireline with a 2-3m fluorocarbon leader. If I am squiding off the rocks I use a rod with a length between 3-3.6m as this will enable me to cast much further. For me, this is an easy one. Catch them and then eat them! If it is a few days before I can actually eat the squid, I will clean them and place them (separately) into a snap plastic bag and store them in the bottom section of the fridge for up to five days. The only time that I may freeze them is when I want to put a few away for baits. To do this I put them into a snap sealed freezer bag and before closing up the snap I make sure that all the air is out. Then I lay them somewhere flat in the freezer. 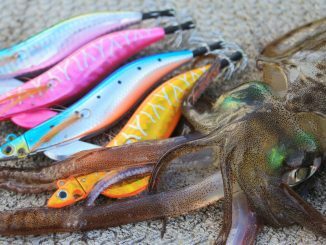 Whether you are going to eat or use the squid as a dead bait (whole or stripped) you need to kill it quickly and correctly. The best way that I have found is to use a squid spike and stab the squid in the brain and twist. You will know that you have done it correctly as the whole squid will instantly go white. When cooking squid you can really get it wrong and it will turn out to be tough or chewy. My son-in-law Andrew is a Junior Sous Chef at the Hilton in Sydney and he has taught me to cut up kiwi fruit and squeeze it over the squid. The acid in the kiwi fruit will soften the flesh. Alternatively, soak it for a short while in a mixture of milk and honey. Whichever way you do it, you will need to make sure that you have washed off the excess before you start to cook. 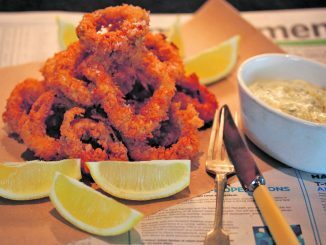 type ‘squid’ or ‘calamari’ into the search box, click and choose away. Get reddy for summer fun!